Today, we’re discussing natural deodorants – why use them, what are some of my favorites, and how they’ll change your life once you start! When someone mentions clean beauty or green beauty, the first thing that comes to mind is deodorant. We’ve all heard the stories and facts on how deodorant is one of the most poisonous beauty products we put on our bodies on a daily basis, yet we still continue to use it. Why, I ask myself, when there are so many other options that are natural and keep you refreshed? Easy – we’re afraid. Let’s be real, everyone’s afraid that they’ll stink if they start “becoming a hippie” and using natural deodorant. Well, my friends, I am here to tell you – you won’t stink! Granted, you need to find the deodorant that works for you – but I promise you, it’s out there. Personally, I work in a restaurant kitchen during the hot summer and can vouch for all of these. Sure, if I’m working 14 hour days, I’ll reapply halfway, but sometimes I even forget and they still go strong! This deodorant was one of the first I tried, thanks to samples I received at the WELL Summit last year, and it’s hans down a favorite. The ingredients list is simple, just how I like it: Baking soda, arrowroot and clay are combined to help keep me dry and controls the odor. Staying dry is a two way street – on one side, I think it’s natural that we should sweat, but on the other side, I sometimes just hate sweating. So it depends on my mood and this works for both my moods. Organic plant oils like jojoba and grapefruit essential oils, as well as shea butter moisturize and soothe sensitive underarm skin, while aromatic essential oils combat bacteria. I love love the texture of this deodorant – note these are all jar creams! Some of these brands do offer a stick version, but I love these little jars too much. 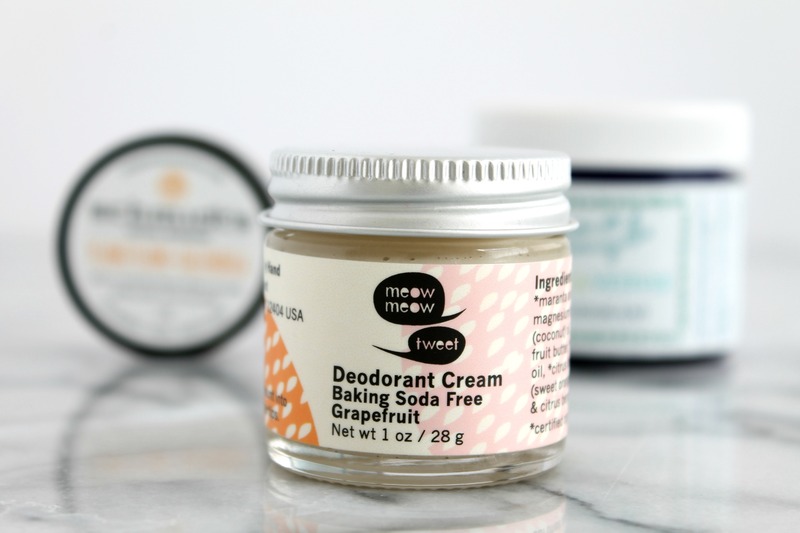 This Meow Meow tweet deodorant goes on pretty easily and absorbs right away as well! This is on the current rotation and what’s getting me through the fall – I don’t even know what vetiver is but who combined with lime, damn it smells amazing! The texture of this one is a little chunkier, meaning you just have use a little of your nail to scrape it up – or maybe I keep it too cold? Either way, it’s packed with great ingredients that I love and if you are a beer drinker, you’re going to love it even more because it has organic hops that help fight bacteria! Arrowroot keeps me dry, aluminum free baking soda helps cut out the smells, coconut oil because duh – it’s amazing, and a blend of organic lim, lemongrass and vetiver essential oils make this smell FRESH. This one, oh this deodorant is a dreamy one. The addition of calendula makes me so happy because it’s one of my favorite flowers and its benefits are unsurpassed! Like the other two natural deodorants mentioned, the ingredients are fantastic and I love that Schmidt’s also includes cacao sed butter in their recipe, along with vitamin E, for even more soothing ingredients. This was a staple this summer in the kitchen and I swear, I not once was stinky. Sure, a little sweaty, but mind you I was working in a 100F restaurant kitchen. The smell of the ylang-ylang reminds me of home, where my mom has a plant right under one of her bedroom windows. So dreamy! 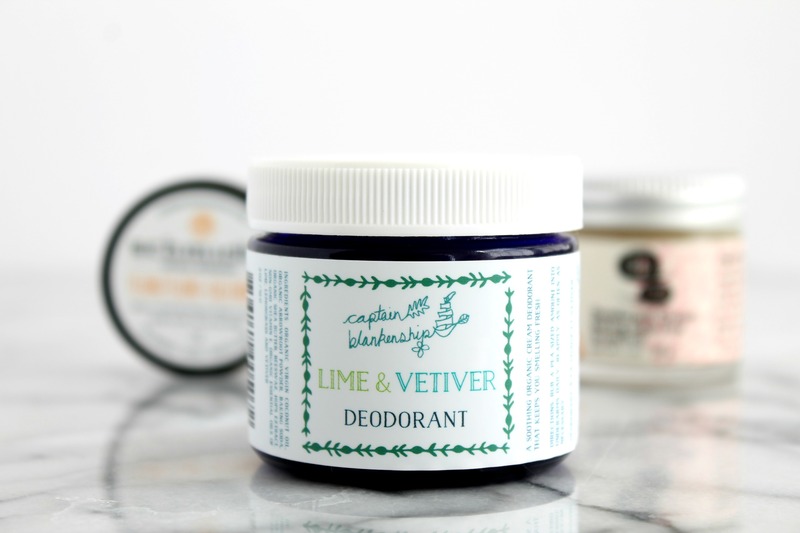 I hope this post gave you some thought on which natural deodorants to purchase and try out on your own – these are my top three favorite brands and I continue to buy them through the seasons, changing up the aromas as I see fit. If you’re looking to change your beauty ways and discover a cleaner path, by far starting with the deodorant is the best way to go. Email me if you have nay questions – happy to aid your clean beauty journey! Disclosure: This post features products received for editorial consideration. Beauty For Foodies receives editorial samples at times and only showcases those that I feel align with the mission of this project, never swayed by freebies. If you have any questions about our process and how products are chosen to be showcased, contact me at marnely [at] gmail [dot] com.